So here I was two days ago, sipping tea and eating brioche for breakfast (recipe to follow by the way) and I started brainstorming ideas for the dinner I wanted to organize for my friend’s birthday, Lena. So many options, and as usually typical of me, I had tons of open magazines with little sticky notes everywhere already on the table. Speaking of which, if anyone has a good suggestion as to a filing system for cooking magazines, I will take it! Flip, flip, flip, no not this one, yeah, maybe, ahh, yes! I finally managed to make a decision. I suppose it must have been all conditioned by the many blog entries I have seen around, with beautiful pasta here and there, such as Flo‘s ravioli here. And so until 2 days ago, I had never made ravioli. I had made lasagna, fresh tagliatelles, spaetzle, but for some odd reason, never had I tried ravioli. I suppose when thinking about it, making ravioli is a learning experience similar to any. Just like reading a manual. There are steps which you need to follow and advice you need to take. I knew about a few things. The dough needs to be nice and elastic, it needs to be very thin, and what else? Of course the pasta will be cooked al dente. And oh yes, and I learned this the hard way, it needs to be used quickly and/or if not, it needs to be frozen to be used later ( I almost had a heart attack when I realized some ravioli got stuck together because I had not let them dry). What else? One thing that I had not been told either : I needed biceps! I will have to leave a lot of room for additions for my Italian readers as they probably know much more than I do. So yes, making ravioli is really some work! I mean, after I made my raviolis for 4 people, that is about 30 ravioli or so, did not even count them, I looked red and puffy, my arms were sore. Roll, roll, roll! God, it is not yet thin enough, continue on! There was flour everywhere, on the floor, and I was covered with it from top to bottom. In the course of this preparation, the door bell rang. I walked to the door and opened it to the UPS man then looking at me. On his face, I could read “what-the-hell are you doing?”. A shy smile appeared at the corner of his lips. I looked at him and mumbled a few words before rushing back into the kitchen. So what! I have my own battles. The truth is that I own a pasta machine add-on for my Kitchen Aid stand to make fresh pasta, but I did not want to use it for my first try as I felt I needed to “feel” the dough (but I also need to add that I was turned off by the mere thought of having to clean that piece, which is a real pain). Call it silliness or stubborness, I just felt that for the first time, I had to do it like they used in the old days and feel the whole process. I prepared a first batch the day before my dinner and made more the second day. And what a nice surprise I got the second time: it became already much easier. So the saying proves true. It is by experience that you improve your skills. So the more ravioli you make, the better you become at making them! Before serving them, I obviously needed to test a few, so I prepared a small plate for myself, with 3 ravioli and a little bit of sage butter. What can I say? It was, it was, well, it was just beautiful! Beware as once you make your own, they are addictive! And oh, you might probably have already seen this too, but if not, go and have a look! I was about to post my ravioli story when I came across Nicky and Oliver‘s ravioli experience (Delicious Days). Amazing! Not saying more, just go and have a look here! Start by putting the flour in a bowl. Make a hole in the middle and add the salt and the eggs, one after the other. Add enough water and work the dough until you get a very elastic dough. If you use a food processor, the dough needs to detach from the bowl. Cover and let rest until ready to use. Wash the spinach and then cook it in salted boiling water for a few mns (5 is enough), then drain well, squeeze the water out and chop it. Mix together the egg with the ricotta cheese and the grated parmesan. Season with salt and pepper and add the nutmeg. Place one dough sheet on a floured surface and place small amounts of filling, separated by 2 inches from one another. 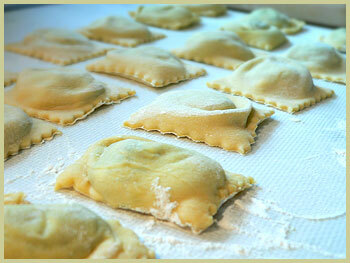 Place another dough sheet on top and with a little ravioli cutter, seal your ravioli. Boil some water in a large pot and cook your ravioli al dente. To make the sage butter, simply melt the butter in a pot and add the chopped sage (as much as you like). Cook on low heat, so that the sage infuses the butter. And serve. I like this dish with arugula salad and thin slices of parmesan. Adapted from Elle A Table. Bea – You are hilarious! From the look of Giada di Laurentiis’ arms, I’d bet she’s never rolled her own ravioli. Ooohh, I so agree. At the risk of sounding like a perv, I like to feel my food too. Never tried to make ravioli or any pasta except gnocchi but I think I am going to try to make this! Scrumptious! Love the texture of the sage! Fabulous story. whew……just perfect and very lovely photos. 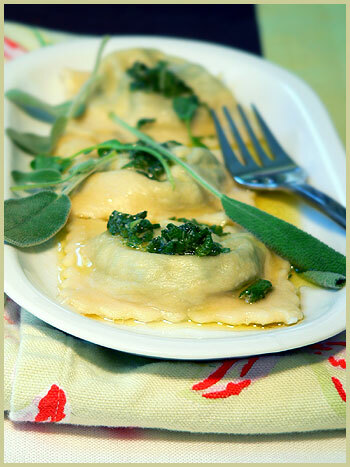 I love ravioli and the sage butter … I look to use this sauce for gnocchi. Lovely, Bea, your ravioli look delicious, and sage and butter sauce is as good as it is simple. Making ravioli is a lot of work. I have a KitchenAid as well, and what I usually do is knead by hand until I feel I’ve got the right amount of flour, then I let the stand mixer do the rest. I also like waiting until my in-laws are visiting — between me, my wife, and them, making ravioli becomes a much easier task. Nothing more to say? Fantastique! Super!Genial! Pronto! Bravo bea, rien que le temps de travail tu merite deja. Très interessant ton site! Buena serra! an extraordinarily lovely recipe … and I love your blog … so pleased to find it! the ravioli, and the company, were fantastic. Thanks bea & phil! Bea, I can almost smell the sage butter sauce from that photograph! If the photo is any indication, your hard work was definitely worth it. Beautiful! Your raviolis’ experience is so funny. And the fresh leaves sage are beautiful. Do you grouw your own garden herbs ? In anwer to a few questions, I usually grow my herbs yes but in the summer only, hence I bought those beautiful sage leaves. And I agree with you L, I love the texture of the sage too. Beautiful and soft. Great colour too. Thanks Rob for the advice, yes extra hands could be needed to coordinate everything, which is the challenge in the kitchen, non? I will definitely make my own from now on, really, so much nicer! bea, i’ve been wanting to tell you that you inspired me to make ravioli after i saw your post about it. i now make my own ravioli and improvise with the filling. i did make the sage sauce because we have sage growing all over and i wasn’t sure i was going to like it but it was great. thank you! Hi Ptinfrance, Yeah!! great news. I am glad to have been able to inspire you. This isw why I have this blog! delicious, tho the skin was really difficult to make, and i also didnt exactly have a ravioli cutter. otherwise it was awesome. thanks for the recipe, it wasnt too hard to make in general, even for a novice cook like me. Looks terrific. 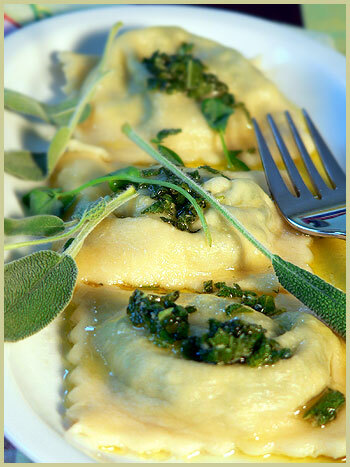 Butter and sage is the perfect preparation for your beautiful ravioli. What egg? says nothing in the ingredients list about an egg in the filling.